On November 9th, 2008, the Centre for Arts and Artists in Newton, Iowa hosted a mother-daughter retrospective art show titled “A Celebration of Art” to celebrate the art of Mary Zmolek and Pauli Zmolek, to be followed by art workshops the following week. In the following essay, Pauli talks about how her mother was a major source of inspiration in her decision to pursue a career as an artist. One of my earliest memories from my childhood is of my mother painting a picture of my oldest brother, Tom. One afternoon in the kitchen of our old house on First Avenue West my mother, who had studied applied art in college, got out her oil paints and a large canvas and sat Tom in front of her. I sat behind her, my brother Mike, just a baby sitting next to me, and watched over her shoulder. Tom sat very still as she studied his face and mixed dabs of paint and applied them to the black canvas. Before our eyes, she was painting a perfect likeness of Tom. To me, it was like watching magic. I looked at her as if she was performing something so miraculous. I will never forget that wondrous moment. In the years that followed, my mother had little time to pursue her art career. Her hands were full with the task of raising four children, especially after my brother Stuart was diagnosed with severe and profound retardation (and later with autism). So for the next twenty years, there were few moments like that one memorable afternoon in our old house. Even though she did not have much time for painting, she sewed all of my clothes, made elaborate costumes for us, made all of my doll dresses and painted and decorated a doll house that my dad built for me. Another way of expressing her art was by encouraging us to draw and paint all the time. Tom actually did several large, abstract oil paintings in high school. Mike started with finger paints but learned to draw portraits before becoming more interested in music. If we weren’t outside playing, she always had something creative for us to do. She had a huge roll of paper and would roll it down the hallway and with a coffee can full of crayons we could draw anything we wanted for hours. My dad was a plant engineer at Maytag and he would bring home piles of discarded blue-prints. We would use the back side to draw or paint anything we wanted without limits. In elementary school, I remember being so excited to take art classes with our teacher, Mary Homeier. I took her classes seriously and she returned my enthusiasm with much encouragement. In second grade, she picked a piece I had done for my first “group art show,” it was a large red poinsettia I had painted. It still hangs at my parents’ house. One year in junior high school my parents gave me a giant set of pastels and a large sketch pad for Christmas. I spent endless hours in my room, mostly trying to teach myself how to draw portraits, still inspired by the memory of that one afternoon when Mom painted my brother. I carried a sketch pad with me all the time during junior high and high school. By tenth grade, I had taken all of the art classes offered and Mrs. Ward, my high school art teacher, helped me set up a curriculum of my own to continue drawing so I could develop my artistic skills. It was a time when my parents were devoted to helping my brother Stuart to learn and grow. What I believe I learned from their struggle is that if you believe in something or want something passionately, you can never, never, never give up. 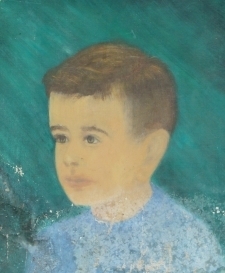 Mary Zmolek’s portrait of her son Tom at around age 11, with water damage. After we were mostly grown up, my mom was able to find enough time for herself to study Norwegian rose-mauling, painting floral designs in oil on wooden pieces like bowls. She learned this skill quickly and was soon painting dozens of beautiful pieces that we all came to treasure. This helped her transition back to doing oil paintings when a Bulgarian painter named Dimitar Krustev came to Newton and was offering art classes. I had just graduated from the art program at the University of Iowa, where I had been introduced to a lot of different mediums. But I was still afraid to touch oil paint. Dimitar introduced me to an academic approach to oil painting, which is what I had been looking for. In 1981, my mother and I went on one of Dimitar’s painting workshops on the Pacific Coast of Mexico. We returned with many finished canvases. After studying with Dimitar for three years, I entered the Schuler School of Fine Art in Baltimore in search of structure and discipline in my art. Mom continued to study with Dimitar for many years, taking part in several more traveling workshops to places like Mexico and Venice, Italy. Living in Baltimore with my faithful chow chow Zoe, I spent several years painting all day long and waiting tables at night. I had discovered the life of an artist, which as everyone knows is a real struggle. It was the life my father had warned me against, always encouraging me to choose a career I could be sure to make a living at. Soon I found myself working for a large company based in New York City that restored murals in buildings like the World Bank. This led to my being hired as the head decorative artist at the U.S. Capitol, the first woman to hold this position. I was soon busy restoring lots of ornamental painting on the walls and I would think of my mother’s rose-mauling skills; it was work she would have been able to do with ease. I was shifted to the Library of Congress, where I worked for ten years before I met my husband Steve and moved to southern Maryland, where I now paint relaxing scenes, mostly watercolors, seeking to capture the traditional life of the watermen of the Chesapeake. I am always proud to say that I grew up in Iowa, where there is so much natural beauty that has inspired both my mother and I to paint. It brings me so much joy to be coming home to celebrate my mother’s birthday and to celebrate our art together with a mother/daughter retrospective show, for two reasons. First, I want to show my love for my mother and my gratitude for all of her inspiration and encouragement. And second, I want to encourage others to develop those skills that they may have been holding back so that I can give back some of the artistic encouragement that I was given when I was growing up in Newton.